the full of surprises closing exhibition from the Philippines to the tune of "Let it Go"
A day has passed and the 5th Philippine International Pyromusical Competition has now come to an end with the last competitor, United States of America, to showcase the grandeur of its fireworks display and of course, our very own, being the host country, for the remarkable closing exhibition. 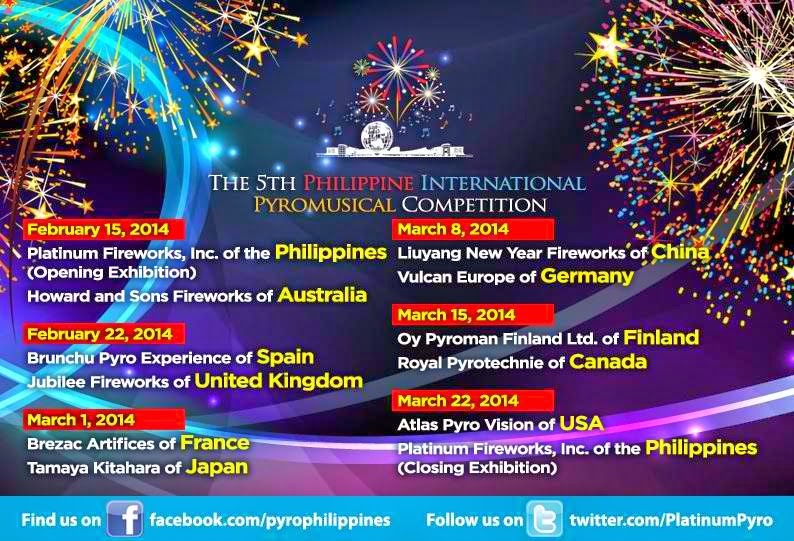 22 March 2014 - I arrived late at the media VIP corner to witness the last show for the 5th Philippine International Pyromusical Competition yet in time for the last competitor's routine in the skies. As there is always something magical when fireworks lit up the sky, the excitement even heightens when the lights are complemented by sounds. After the presentation of the United States of America, everyone was at awe and waited for the announcement of winners. This years competition was participated by ten countries of outstanding credentials in the fireworks industry and world competitions. Fortunately, for this year I was able to witness China, Germany, USA and the Philippines exhibition in the skies. With this, while other performers are equally stunning to a spectator who doesn't know the technicalities of judging like me, the list of winners could serve as a guide on future pyromusical competitions on which to watch out for. After the announcement of winners, it was time to witness how world class our very own, Platinum Fireworks, Inc. of the Philippines is, in this industry. Truly, the show was spectacular. If Philippines was one of the contenders, I am confident they would have bagged a place and special awards. The display was full of surprises and with the multi-awarded song Let It Go as background music, the crowd began to applause and cheer with all their might. Special thanks to SM and sponsors for making me experience a one-of a kind display of lights in Metro Manila.